Around 200 million years ago, the super continent 'Gondwana' broke apart. The tectonic plates that cover the Earth's surface shifted. Lava erupted between the plates from the Earth's deep interior forming new ocean basins. Today the continents are slowly moving towards each other to eventually rest together once more. The question is why? The answers lie in the deep. "The earth's special because the outer-most crust is able to move, and that gives us mountain ranges and ocean basins that move and change dynamically through time and that enables life to exist on our planet"
Marine Geophysicist, Associate Professor Joanne Whittaker, is studying the fundamental processes that drive plate tectonics. She is interested in how the ocean basins form, how the continents move and how the Earth's surface motions react with the viscous interior. 'Essentially, I want to understand how the Earth works. But we are constrained by sparse and incomplete data,' she said. 'Plate tectonics has only been around as a theory since the 1950s. There is good surface data and old rock samples but relatively little data from the deep Earth ocean floor. We know more about the surface of the moon than we do about the deep ocean. Underwater exploration is remote and time-consuming and it is expensive,' said Dr Whittaker. Associate Professor is studying the past 200 million years, to try and understand where the plates were, why they shifted and what is happening now. The data is fed into modelling to map and reconstruct the movement of the plates. 'It is literally a giant jigsaw puzzle!' She said. Associate Professor Whittaker is well known for developing an understanding of the interaction between eruptions from the mantle, the earth's molten core, and the surface motions of the tectonic plates. She studies satellite data of the ocean floor to look for interesting features that reveal information about ancient plate motions and their interaction with the hot, viscous mantle below. She led the team to explore two big underwater plateaus, together roughly half the size of Tasmania, off the coast of Western Australia, in 2011. 'We collected geological and geophysical data from the ocean floor, and what we found was that the plateaux are little pieces of India that were left behind when it broke off from Western Australia 100-104 million years ago,' she said. Associate Professor Whittaker is particularly interested in the movement of Australia away from Antarctica around 35 million years ago. She has been collaborating to look at how this separation influenced paleo ocean circulations. Taking core samples from sediments on the ocean floor, they are analysing fossilised fish teeth to determine what the ocean currents and circulations were doing around 35-30 million years ago, and how this was influenced by the position of Australia and Antarctica. 'It provides us with another piece of the jigsaw puzzle. The teeth are like little tape recorders that can tell us a lot about the ocean currents at that time. The currents were effected by the separation of the continents, and the latitude that the continents were at,' said Associate Professor Whittaker. Understanding the evolution of continents over millions and billions of years can also identify the likely location of mineral, oil and gas deposits. The data collected and models produced by Associate Professor Whittaker are used by industry to inform further exploration. 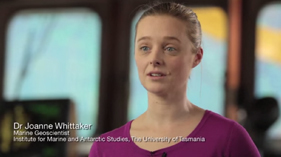 Associate Professor Jo Whittaker joined the Institute for Marine and Antarctic Science (IMAS) at the University of Tasmania in January 2013. Her research interests are predominantly in plate tectonics, marine geophysics and geodynamics. 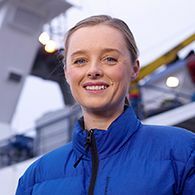 Jo completed a combine science/commerce undergraduate degree with Honours in Geophysics from the University of Sydney in 2003, followed by a Masters in Geophysics from Victoria University, Wellington, New Zealand. She received her PhD, on the tectonic consequences of mid-ocean ridge formation, evolution and subduction, from the University of Sydney in 2008. Following graduation she worked both for industry (GETECH in the UK) and academia (post-doc, University of Sydney). Jo has experience teaching across a range of geoscience subject areas in both classroom and field based settings in areas such as the fundamentals of plate tectonics, ocean basin formation and morphology, isostacy,mantle plumes, magnetics and marine sedimentation patterns. She also has experience teaching intensive courses, e.g. the use of GMT (a specialised set of open source command line tools widely used in the geosciences), and Gplates (open source plate tectonic reconstruction software). Jo is an academic in the field of marine geoscience. Her research focuses on understanding fundamental Earth system processes and mechanisms, with a focus on understanding the evolution of Australia, Antarctica, the Southern Ocean, and the Eastern Indian Ocean. Jo's research encompasses two of the University of Tasmania's research themes, the Marine, Antarctic and Maritime theme, aligning with IMAS and the ARC Antarctic Gateway Partnership Special Research Initiative, and the Environment, Resources and Sustainability theme, aligning with research strengths in the School of Physical Sciences and CODES. Her research interests are in the field of plate tectonics, geophysics and geology specifically looking at the formation and evolution of continental margins and oceanic crust. She uses marine geophysical and geological datasets to understand how the interaction of upper mantle convection patterns and surface plate tectonics shape the formation of the seafloor and ocean basins. Studying plate tectonic process and surface and basin geology in concert allows analysis of both horizontal plate tectonic driven vertical mantle driven processes that together control the evolution of ocean basins over millions of years. Jo's research style is strongly collaborative, manifested by a wide range of national and international co-authors. Nationally, she has robust and productive collaborations, co-authorship, and co-led grants with the EarthByte Group led by ARC Laureate Fellow Professor Dietmar Müller at the University of Sydney, Professor Louis Moresi's group at the University of Melbourne, and Geoscience Australia. She collaborates with leading geophysicists and geodynamicists internationally, e.g. at the California Institute of Technology, University of South Carolina, the University of Hawaii, and University of Oslo. Jo regularly publishes papers on topics such as plate tectonics, marine geophysics and mantle-surface interaction in journals including Nature, Science, Nature Geoscience, and Earth and Planetary Science Letters papers, and a first-author manuscript is currently under review with Nature Geoscience. In 2009, she was invited to write a News and Views piece for Nature Geoscience. Jo regularly acts as a reviewer, for journals including Nature Geoscience, Geology, Geophysical Research Letters, Gondwana Research, Geochemistry Geophysics Geosystems, Geophysical Journal International, and the Journal of Biogeography. Jo has been awarded significant funding and research support, including a 2015 ARC Discovery Project and a 2014 ARC DECRA. Additionally, she has been highly successful in obtaining shiptime on large national and international scientific research vessels through competitive peer review processes. This project is aligned with objective No 5 of expedition 369 (see scientific prospectus), which broadly set to investigate the tectonic and depositional history of the Mentelle Basin during the Mesozoic rifting and breakup of East Gondwana. The proposed post-cruise research aims to determine the provenance and the tectonic history of the sandstones recovered at site U1515 to redefine the early tectonic and paleogeographic evolution of the rifting East Gondwana margin. The following specific objectives will address this overall aim:1.Examine the provenance of sandstones from selected intervals from site U1515 to identify source terranes and establish sediment dispersal paths. We will test the hypothesis of an East Antarctic provenance of sediments in the eastern Mentelle Basin and investigate changes in paleo-drainage systems across southwestern Australia and East Antarctica.2.Acquire high-precision (U-Th)/He ages from pre-breakup sandstones in the eastern Mentelle and Perth Basins to investigate the vertical motion of the whole conjugate region at breakup and tectonic links with conjugate structures in Antarctica. The project focuses on isotopic composition analyses of sediment samples recovered during IODP Expeditions 367/368 in the South China Sea, in order to understand the early stages of lithospheric thinning/breakup in the northern South China Sea. Oldest magnetic anomaly (basement ridge A) is drilled twice during the IODP expeditions, but different types of basement material is recovered (MORB-like basalt, sediment gravel) which are dated to the same age. We propose two possible scenarios of the sedimentary/tectonic evolution of this basement ridge, which canbe tested with isotopic composition analyses (Nd, Sr, Hf) on the sediment gravel unit. Sr isotopic record on the authigenic fractions will provide constraints for the depositional age. Nd isotopes will constrain changes of source provenances through time of the deposited material. The aim of this workshop is to bring together experts to develop a mature version of an IODP pre-proposal to be submitted in April 2019, based on our presentation 4.8 Completing the Australian-Antarctic transect at the IODP Regional Planning Workshop in Sydney. The aim is to drill within the Australian-Antarctic Basin to target the objectives: 1) Development of the Antarctic Circumpolar Current, 2) Lithospheric thinning processes during Australian-Antarctic Breakup, 3) Climatic evolution of Antarctic glaciation. South-east Australia has a complex and fragmented geological history. Over the past 550 million years platetectonic processes have resulted in the formation of metal-rich mineral deposits. This project aims to develop andtest models for evaluating past tectonic processes and configurations, using both new and existing geological,geophysical and isotopic data. The information gained will be used to identify areas of high potential foreconomically valuable ore deposits, thereby enabling more efficient prioritisation of mineral exploration efforts.This will increase the probability of significant ore deposit discoveries leading to national economic benefit. This project will refine the plate model for the configuration, amalgamation and dispersal of East Gondwana, with implications not only for understanding the bedrock of Antarctica, but also the evolution of the Australian continent. The Perth Abyssal Plain is a poorly understood ocean basin located offshore of Perth, WA, thathosts a critical early record of the continental breakup of the supercontinent Gondwana at ~130 100 million years ago. This record elsewhere has been destroyed or overprinted. Our proposalinvestigates the affinity and origin of seafloor basalts and continental granites that have beendredged from the seafloor. We will apply state-of-the-art geochemical tools as part of anintegrated geological and geophysical study. We aim to produce a plate tectonic model for therifting of India-Australia-Antarctica and the birth of the Eastern Indian Ocean. We will use a combination of 3D geodynamic modelling, plate kinematic reconstruction and geological and geophysical synthesis to determine how congested subduction zones influence plate kinematics, subduction dynamics, and tectonic evolution at orogen and global scales. We will deliver a transformation change in understanding the links between congested subduction, mantle flow, trench migration, crustal growth, transitions between stable convergent margin configurations, and deformation in the overriding plates of subduction zones. Determining these relationships is significant because it will provide dynamic context to interpret the geological record of ancient convergent margins, which host a large percentage of Earth's metal resources. Plumes of molten rock rise from deep within the Earth resulting in massive surface eruptions that can lead to global mass extinction events. Despite their size, the role plumes play in driving movements of the continents is poorly understood. This project combines independent global and Australian geological and geophysical data with open software systems to link deep Earth and surface geological processes. This approach will result in a clearer understanding of how the internal workings of our planet drive and interact with surface geological processes, and how these interactions shape the environmentally important, and resources rich, continental margins and ocean basins. This project will characterise the poorly known Perth Abyssal Plain passive margin by collecting new magnetic anomaly tracks from the oceanic crust and directly sampling rifted continental fragments such as the Dirck Hartog Ridge, Batavia Knoll and Gulden Draak Ridge. The new magnetic anomaly data will enable resolution of the controversial seafloor spreading history of the Perth Abyssal Plain, where currently there are two competing interpretations. This revised reconstruction will enable the development of regionally consistent plate reconstructions resolving the current poor fit between India, Australia and Antarctica. Geochronology and geochemistry on dredged samples will determine the affinity of these rocks for the first time, characterising the key tectonic features offshore southwest Australia. Jo has a history of successfully supervising research thesis students in a range of plate tectonic and marine geophysical topics. She is always keen on hearing from students interested in global and regional marine geophysics, plate tectonics, and the interaction between the deep Earth and the surface, for example around topics such as Large Igneous Province formation, micro-continent continental margin evolution. There are regularly opportunities to participate in research voyages.